So my intention has never been to make this a daily outfit blog….but! 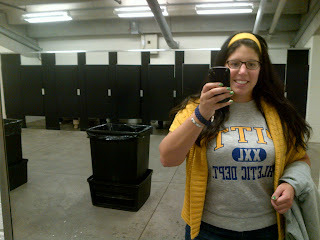 I wanted to share this outfit I wore to the Pitt game last night. Please ignore my overall appearance, this shot was not planned as you can tell! It was comfortable and Athletichic at the same time! It’s amazing how just layering can take a sporty outfit to a fashionable one! It was a vintage Pitt sweatshirt that I cut the sleeves off of, and a gold knit short sleeve cardi on top. I took the self belt from the cardi and put it in my hair. What have you been wearing to sporting events this year? Hey superstar!!!! Wanted to drop you some stylistist luv! You rock!